The world is changing, more people are being sent to prison than ever before. There is now an opening for privatised prisons and rehabilitation centres to relieve the government owned prisons of this ever increasing influx. A few years into the future a new firm known as IVRRAC gets approval from the New Zealand government to rehabilitate minor offenders. They have had a one hundred per cent success rate with thieves, small time drug sellers and extortionists; however their costs are hardly covered by what the government is willing to pay for their services. So when the government offers them an obscene amount of money to take Simon, a murderer of seven rich socialite women, they jump at the chance. IVRRAC has never rehabilitated a murderer before so they are unsure about how successful their unique rehabilitation technique will be. Simon is also a vicious and insidious killer so they have to be very careful as they know their technique could fail. Do they keep him locked up in case of failure? 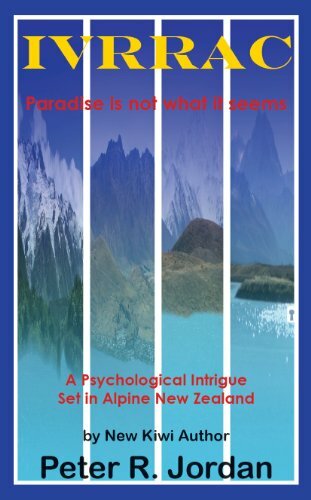 No after processing Simon, to prove the technique works, they ship him out to the richest valley in New Zealand, Trentsworth and immerse him into a society full of the people he has spent the last fourteen years murdering. If Simon can spend six months in Trentsworth without killing one of the locals the technique has worked and he is a free man. Of course IVRRAC has men on the ground to catch him before any harm can befall his neighbours. Simon is well aware he is under surveillance and this increases his desire to escape the valley and IVRRAC’s forever watchful eyes. Through his ambition to escape he falls in love with Kyndrea his new next door neighbour whose father owns the only amphibian plane and means of escape in the valley. After a time he realises she could never love him back once she knew his history and he decides to use her solely for his escape. From the aftermath of his subsequent actions he discovers what the acronym IVRRAC stands for, the dark murderous secrets of the IVRRAC process and that Trentsworth is not at all what he thought it was.